better late than never! 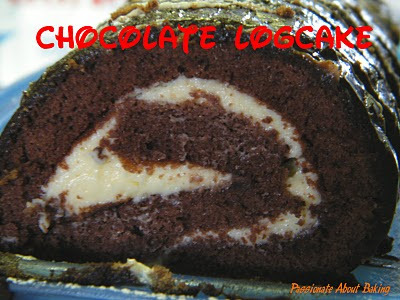 your log cake looks great! i didnt manage to cough out the time to do a log cake this year, will do so in the coming year. Jane, here's wishing you a very merry and wonderful Christmas! nice logcake! I been thinking of using ganache for the frosting. Cream cheese filling sounds like a great idea. 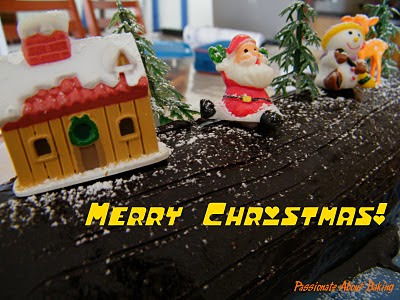 enjoy your log cake and may you and your family have a joyous weekend! Merry Xmas and happy new year!! If you're tired, don't force yourself to bake. You may risk turning your passion against you instead. I'm serious. I'd been thru that. Nice buche de noel! Merry X'mas to you and family! Merry Christmas! Hope you are getting well! 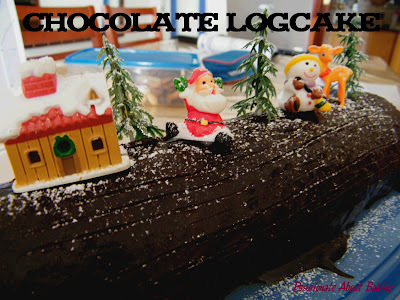 Nice logcake! beautiful log cake jane! merry xmas! Jane, the log cake is pretty. Merry Christmas and Happy New Year to you and your family! Thank you everyone! Have a wonderful holiday too! Yes, I know what you meant. That was why I didn't force myself to bake when I just don't feel like it. When the mood wasn't right, I just won't try. Thanks! Thanks very much for your well wishes! I've recovered, except for some running nose still. Will get well for New Year! Once again, thank you for hosting this despite being so busy this December. Merry Christmas!!! You've a lovely and chocolatey log cake! Wishing you and all your family have a wonderful and blessed Xmas! Hi Jane, happy holidays and a really delicious looking log. I actually prefer a chocolate one to a plain vanilla one. I'm just like you! Chocolate for me anytime please! This looks great- looks like a real log!